You are what you eat–and so’s your pet! Preventative care starts with food. Just as with humans, a pet’s nutritional needs change with age, lifestyle, and based on medical conditions. 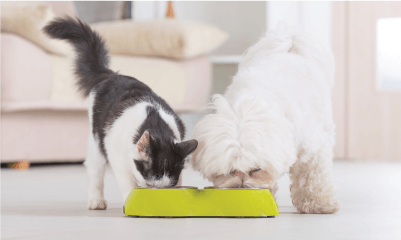 Add to that all the conflicting information about conventional pre-packed kibble, grain-free diets, raw and home-cooked feeding plans and it can be very confusing to figure out what to feed your animal companions. Your Walnut Creek veterinarian can help you take the guesswork out of choosing a suitable diet for your pet. We also carry iVet Pet Formula, IAMS, Royal Canin, Hill’s as well as Lean Treats and Nylabones that you can purchase right at the hospital. Your pet depends on you to make the right nutrition choices for them; make sure you know how. If you have questions or concerns about your pet’s nutrition, schedule an appointment with a Walnut Creek veterinarian today.